Recently I was faced with two similar boxes: one of them contained something for me. But which? Recently, I had another birthday (MAN those keep coming up, don't they? and just when you resolve to stop eating cake, too.) A few days before that happens I usually hear the eternal question, "So... what can I get you for your birthday?" and this year, I was ready with an answer. But the manufacturer of the What made a mistake in the shipping and accidentally sent the wrong thing, then said Oops and sent the right thing. That made it much easier for me to know which box to open. The one with the larger tracking number, of course! 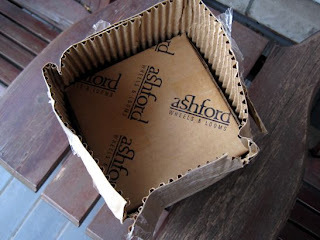 If even Ashford isn't perfect, then I feel much better about my chances of hand spinning sock yarn some day. 1. I really like spinning yarn by hand. 2. I really like my Ashford Joy spinning wheel. 3. I really, really wish I could ply just about 20% more yarn onto the bobbin so I wouldn't have to keep breaking and wasting bits of the final product. Which is where my present comes in. 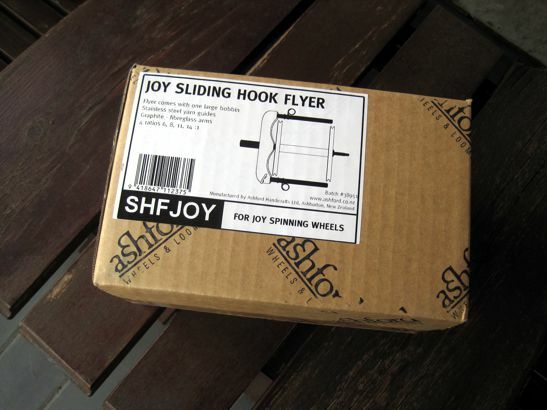 It's a new Ashford Joy Sliding Hook flyer, compatible with my Joy spinning wheel, and it's big enough to hold a bobbin (supplied with same) that holds 30% more yarn. Bonus: the sliding hooks mean I won't have to stop and manually shift the yarn any more. The bigger size means I'll have to adjust my standard tension, but I can live with that. when I pulled out one of the two sheets of instructional paper that were packed with it I saw some words that made my blood run cold. "The E-Clips are under tension and can fly off. Wear eye protection." It was at this point that I put everything back into the box and stepped away. But a couple of weeks later I looked at the box again and realized I should have read the heading of that page. Turns out the flyer comes with an adapter kit for Joy wheels made before 2002, and that's what all that was about; for my much more recent Joy, all I need to do is tuck the new flyer into the old flyer's carry compartment and proceed as usual. More fiber from Twisted Fiber Art! and still more to come, because I got a spot in this season's club. Yes... the Other Box. Well, the sliding hook flyer was ordered from The Fibre Garden in Jordan Village - love that store - and when the gentlemen there discovered the error they couldn't have been nicer. 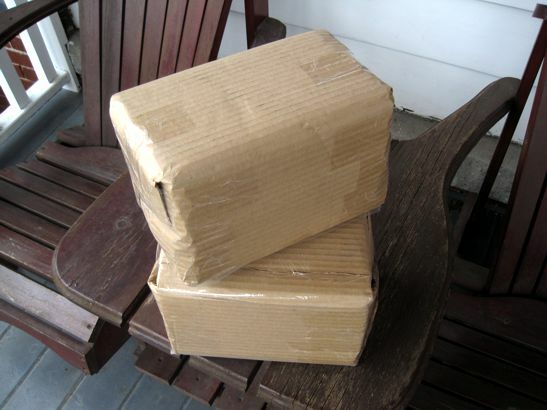 All I have to do is a/ drop the wrong parcel at the shop, or b/ ship it to them to return to Ashford. Sadly, the shop was closed the day I was in their somewhat distant neighbourhood last week. So that means shipping. Or... erm... keeping? You know, just in case I ever want to spin really crazy big yarn with Ashford's new Freedom Flyer. Ahem. Yay!! My only real complaint about my Ashford wheel is the smallish bobbin size; fixing that will really help your production! Nah - send it back. 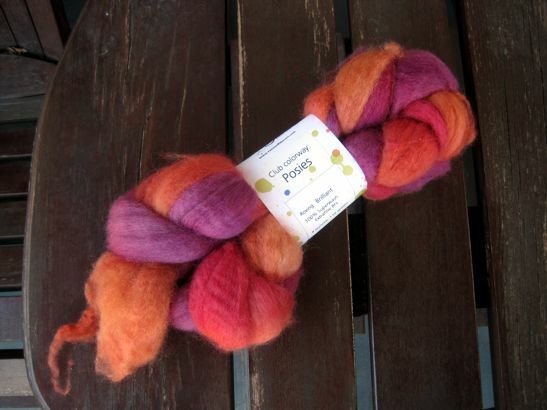 You can spin nice art yarn with what you've got. And shouldn't they cover the postage anyway, since it was their error, not yours? Oh yes, of course - postage covered!